On Saturday, April 23, 2016, a young woman and young man tempted fate and one died off of Kentucky's Pope Lick Creek Trestle. I posted the news of this tragedy at my other blog, Cryptozoonews, in "Woman Killed Searching For Pope Lick Monster," (Coleman, 2016), yesterday. The woman has been identified as Roquel Bain, 26, and this appears to be her image. In Roquel Bain's purse, investigators found a work badge at the trestle death site that indicated she had worked as a surgical assistant (Warren, . The photograph above, online, identifies this individual as "Roquel Bain, Surgical Technology," (photobucket, 2016). The specifics of this incident at Pope Lick Creek is interwoven with twilight language, and deserves a look here, as well. The Pope Lick Monster is one of the urban legends that are vaguely referenced in sightings and stories of Goatmen and Satyrs seen in various locations (e.g Fairfax County, Virginia; Plain Dealing, Louisiana; Lincoln, Nebraska; Pope Lick Creek, Kentucky), (Hall, 2005; Coleman, 2009). 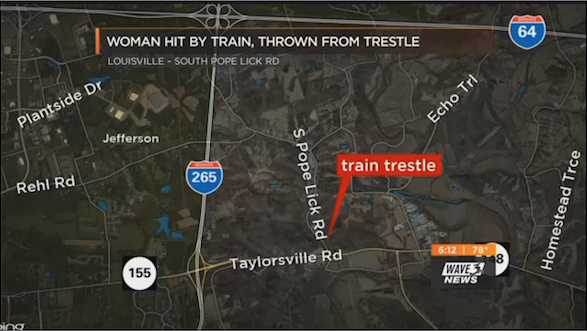 At 7:30 p.m. Saturday, April 23, 2016, the Louisville Metro Police Department’s Eighth Division responded to a report of a pedestrian struck in the 3100 block of South Pope Lick Road, off Taylorsville Road just outside of the Gene Snyder/Interstate 265. Bain had fallen 100 feet after being hit. (WAVE, 2016a, 2016b). With the discovery of the body, an unfortunate story unfolded. Roquel Bain of Dayton, Ohio, and an as-yet-unidentified boyfriend had purchased tickets to the 10:00 pm "haunted tour" of the Waverly Hills Sanatorium on Saturday night, April 23, 2016. The Waverly Hills Sanatorium is a closed sanatorium located in southwestern Louisville/Jefferson County, Kentucky. It opened in 1910 and closed in 1961. Waverly Hills has been popularized on the television show Ghost Hunters as being one of the "most haunted" hospitals in the eastern United States. The sanatorium was featured on ABC/FOX Family Channel's Scariest Places On Earth, VH1's Celebrity Paranormal Project, Syfy's Ghost Hunters, Zone Reality's Creepy, the British show Most Haunted, Paranormal Challenge and Ghost Adventures on Travel Channel. Also popularizing Waverly Hills was the film Spooked: The Ghosts of Waverly Hills Sanatorium, released in 2006, which purports to document paranormal sightings at the site. (Wikipedia, 2016a). The popularity of the Waverly Hills Sanatorium and the associated tours has increased greatly by the location being featured in so many reality programs. The boyfriend told officials he and Bain came to town from Dayton for a paranormal tour scheduled from 10 p.m. to midnight Saturday. Brandon Barnes, a security guard at Waverly Hills Sanatorium, said Bain had purchased two tickets online for $25 each for Saturday night's guided tour, which was attended by 45 ghost hunters. As Bain and her male companion were early, and waiting for the sanatorium tour, they learned of the local legend of the "Pope Lick Monster." (The 1988 indie documentary The Legend of the Pope Lick Monster is well-known locally.) They decided to go "check it out," and found the railroad trestle. Thinking it was an abandoned railway, they decided to go up on it and look for the "Monster," despite the warning signs on private property. The deputy coroner said he personally has investigated a handful of fatal train incidents that ranged from a homeless person falling asleep on the tracks, to a thrill seeker misjudging the time they had to get off the tracks to someone committing suicide. He said this is the first victim confirmed searching for the monster. During his investigation, Arnold said he has learned that the area is popular with teens and young adults - especially on New Year's. 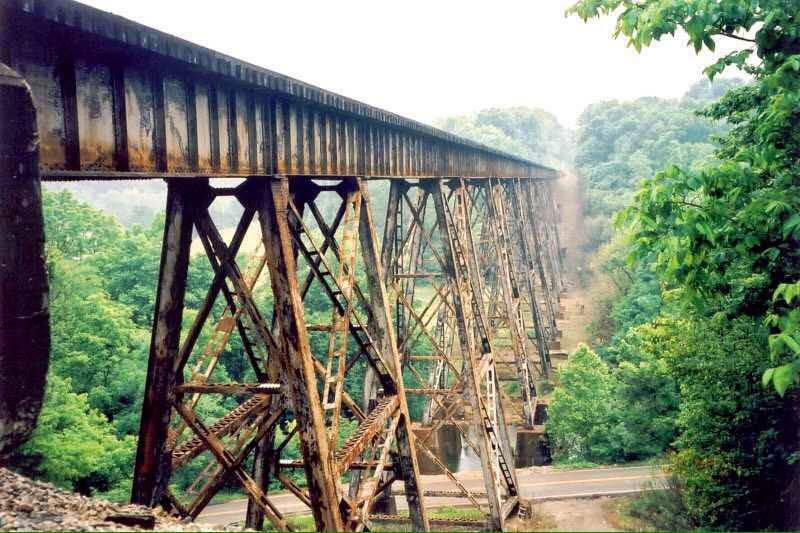 The nickname of the site is the "Trestle of Death," and this appears to be linked to deaths from 1986 and 1987. 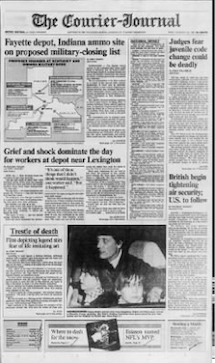 The Louisville Courier-Journal of December 30, 1988, published a page one essay, in the lower left-hand corner, "Trestle of Death," which detailed these two incidents (Louisville Courier-Journal, 2012). 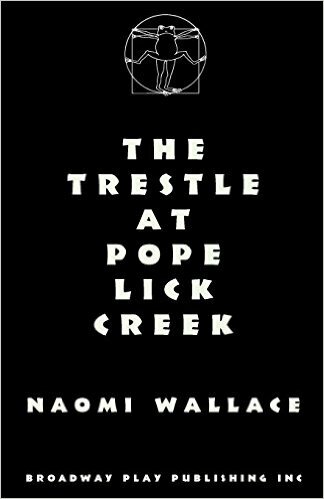 In the fiction play, The Trestle at Pope Lick Creek by Naomi Wallace (Broadway Play Pub, 2000), the story of the trestle and death is set the 1930s. Naomi Wallace, from Kentucky, was a 1999 recipient of the prestigious MacArthur Fellowship, the grant popularly known as the genius award. A published poet in both England and The United States, she has also received grants from The Kentucky Foundation for Women and The Kentucky Arts Council and a 1997 NEA grant for poetry. According to 2016 news accounts (see references below), either the Bain death is the only fatality directly associated with the hunt for the Pope Lick Monster, or it is one of many. The surname Bain originates in Scotland/northern England, where it was originally a nickname meaning "bones." It is also from the Welsh ap Einws, (son of Einws = "anvil"). SE shared that Baine is derived from the Irish word meaning "pale or white." But there are other meanings. It is said to be from Middle English bain, bayne, bayn, been (“direct, prompt”), from Old Norse beinn (“straight, right, favorable, advantageous, convenient, friendly, fair, keen”), from Proto-Germanic bainaz (“straight”), from Proto-Indo-European bhei-(“to hit, beat”). Cognate with Scots bein, bien (“in good condition, pleasant, well-to-do, cozy, well-stocked, pleasant, keen”), Icelandic beinn (“straight, direct, hospitable”), Norwegian bein(“straight, direct, easy to deal with”). James Shelby Downard's research in King Kill 33 notes that Bain relates to Bane ("fatal cause of mischief"), and in Scottish legend, the Bain Fairy is a death fairy who is the keeper of the Bain Bridge. King Kill 33 noted the American battleship Bainbridge, which was dedicated by Lyndon Baines Johnson, is a harbinger of death, according to Downward, (Coleman, 2012a, 2012b, 2012c). Question is, did James Shelby Downard anticipate the whole thing? In my “Sirius Rising,” right up-front is Downard's enthusiastic digression on the Baines / MacBeth angle behind the JFK hit. Now, checking back, I see that he may have picked up on this from the then-obscure satirical play MacBird, dating from 1967, which reportedly plays around with the onomatology. Shelby seems to have had prescient dark suspicions about Lyndon Baines Johnson himself, whose curiously nicknamed wife (née Claudia Taylor) started the whole bizarre Bird business. Recently, new testimony against LBJ has emerged, from Jackie Kennedy and E. Howard Hunt. I highlighted the location of the Pope Lick Monster, which is in the Big Lick Triangle, at this Twilight Language blog, as #6, here. Our sincere condolences to Roquel Bain's family and friends for this tragedy. Brandon, Jim. 2012. Personal communication to Loren Coleman. Coleman, Loren. 2012a. "Bane/Bain: Batman's Villain & Romney's Curse (Part 1)” July 15. Coleman, Loren. 2012b. "Bane/Bain Continues (Part 2)” Twilight Language. July 17. Coleman, Loren. 2012c. "Bane/Bain Bursts Bare (Part 3)” Twilight Language. July 19. Coleman, Loren. 2015. "#6. The Big Lick Triangle, Indiana and Kentucky" in "
Louisville Courier-Journal. 1988. "Trestle of Death." December 30. BAIN, Roquel Age 26, died suddenly and unexpectedly in a tragic accident on April 23, 2016 while visiting Louisville, KY. Roquel had graduated from Springfield-Clark Career Technology Center in 2006 and Miami Jacobs Career College with a degree in Surgical Technology in 2009. 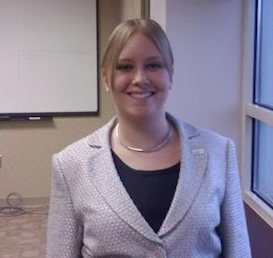 She was employed at Miami Valley Hospital in Dayton, OH as a surgical assistant. Along with her many talents, Roquel was a brilliant artist and painter and an amazing multifaceted musician. Her warm, glowing personality and contagious laughter will be missed immensely by all those whose life she touched. Roquel is survived by her beloved son, River; her mother, Connie Brown; her father, Brian Bain; her brother, Devin Pontsler; her grandparents, Phil and Cindy Brown, Kenneth and Linda Rowlett, and Ann Bain; her aunts, Katie Brown and Betsy Bain; her uncle, Doug Brown and Carolyn; and her cousins, Clarissa Vanover, Ayden Teegarden, Zayne and Zoe Brown, and Eric Ratliff. A memorial service will be held at 2:00 p.m. Sunday, May 1, 2016 at the JONES-KENNEY-ZECHMAN FUNERAL HOME. Friends may visit with the family from 1:00 until 2:00 p.m. Private burial will be held at a later date. 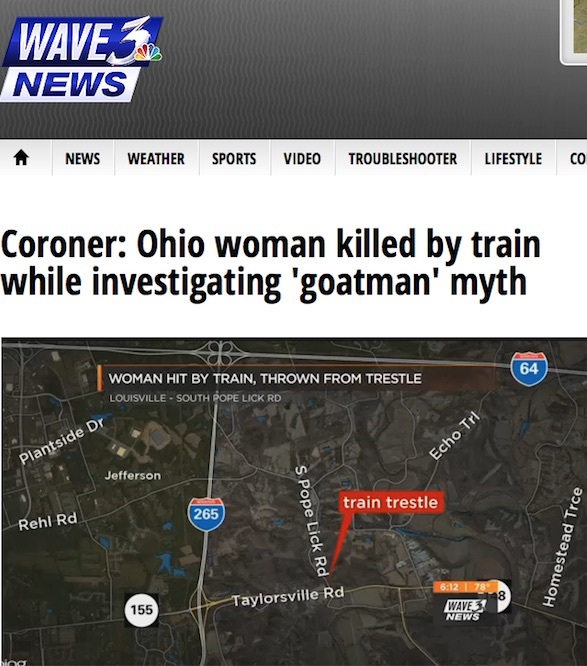 It is remarkable that more people aren't either seriously injured or lose their lives searching for cryptids. They truly do some outrageous things. Then again I'm from the cowardly don't tempt fate school of armchair exploration. The picture is accurate. I dated her for two years. She was a very adventures, daredevil type person. She had no fear of anything. Unfortunately this time she paid the ultimate price. It is very sad to hear about this. My condolences to all the family. USS Bainbridge (DLGN-25) was a nuclear-powered missile frigate launched in 1962, while Kennedy was still in office. The design was closer to a destroyer than a battleship, and was named after the USS Bainbridge (DD-1), the US Navy's first destroyer which served in World War One.